ANTRIM minor football manager, Hugh McGettigan insists Fermanagh will start as slight favourites for Sunday’s Ulster Minor Football Championship preliminary round tie at Brewster Park. The Enniskillen venue has been a happy hunting ground for the young Saffrons in recent years as they overcame the Erne County in their opening game in both the 2014 and 2015 competitions, but there are just a couple of survivors from last year’s win. Conor Small and Patrick McCormick were involved 12 months ago, but the majority of the team will get their first taste of the Ulster Championship this week and that is a major handicap according to McGettigan. “This is a fairly fresh team,” said the Rossa clubman. “We only have one or two who started last year whereas they have eight or nine so they will be going in thinking this should be a better year for them. “We would be hopeful for next year as we should have a lot of las back in, so with their experience they would be looking like favourites. “Sean McGoldrick had them the last two years and he felt they were more organised in the second year as he had the people around him that he wanted. Fermanagh certainly have real quality in their ranks with Ulster Colleges’ All-Star, Tiernan Bogue a stand-out. Tempo’s Lorcan McStravick is another to watch while they are backboned by many of the Enniskillen Gaels side who won their county championship last year. Antrim are also blessed with some fine players however. Small – who is a survivor of the last two wins over Fermanagh – will be tasked with leading the way up front in an attack that will be without the talents of CJ McKenna who withdrew from the panel. Matthew Rodgers, Liam Quinn and Sean Kelly all experienced MacRory football with St Mary’s, Magherafelt which is a major boost having mixed it at the top level in the Ulster Colleges’ blue-riband compeittion. City clubs are well represented too, with Michael McGreevy (Rossa), Eoghan McCabe (St Gall’s), Joseph Finnegan (St Brigid’s) and Eoin Nagle (St Enda’s) just some of those involved. Antrim have already met this weekend’s opponents this year when they scored a 0-13 to 1-8 win in the Ulster League back in March, but McGettigan identified some problems in that game his side could encounter this time around. “We played Fermanagh in the Ulster League down in Derrygonnelly and we won, but it took two points in injury time,” he reports. “What we noticed that day was that Fermanagh very very big and strong. They have a lot of lads who played MacRory Cup for St Michael’s, Enniskillen and seem very confident as to where they are going. That gives us a lot to play for because they are much more confident this year than they were last year. 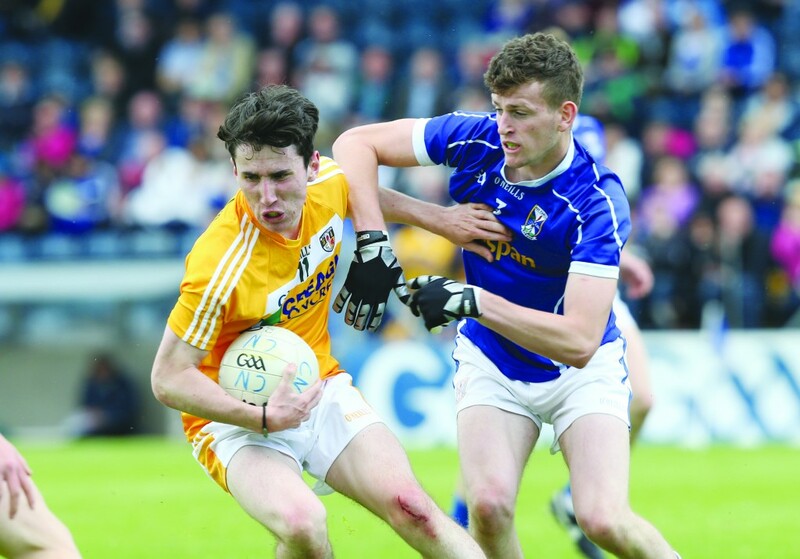 Antrim did enjoy some fine results in the league, scoring a rare and impressive win against Tyrone, but suffered losses against Donegal and Derry. They did recover to win the Plate competition, defeating Down in the semi-final before getting the better of Derry in the final. McGettigan admits it was something of a mixed bag, but with teams running their eye over a high number of players, it is hard to read too much into those results. “It’s difficult to know because you are out against teams who are trying different players and different formations,” he admitted. “You just never know from one game to the next where you are going. We would be a wee bit worried going to Enniskillen and giving away a bit of bulk to these guys, giving them a start and then you are in trouble. Those results are sure to give this Antrim team some confidence travelling to Brewster Park this week, but the big occasion could play a part in the outcome of this game. On such a big stage, nerves are sure to play a part, but McGettigan is hopeful some experienced heads in his backroom team can help settle the young Saffrons down and he is hopeful of a result this week. “It’s a big occasion, but we have a bit of expereince in helping us with Carl McCabe (former St Gall’s manager) coaching,” he revealed. “Seamus O Tuama is in with us too and then we have Brian Gribben from Cargin and Benny Devlin from Moneyglass is our goalkeeping coach, so they are all in helping away along with Columb Walsh from Aghagallon.